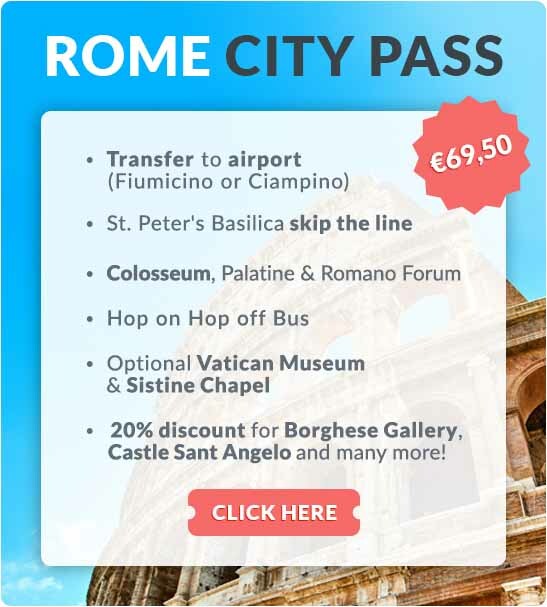 Would you like to visit the ‘Arcibasilica di San Giovanni in Laterano’, or the Archbasilica of St John Lateran in Rome? All the information you need about this church in Rome. Dresscode Many of Rome's churches have dress codes. Please be sure to cover your knees and shoulders and do not wear flip-flops. The ‘Arcibasilica di San Giovanni in Laterano’, or the Archbasilica of St John Lateran in Rome was founded in 313 under emperor Constantine the Great. Emperor Constantine was the emperor who, with the ‘Edict of Milan’, allowed freedom of religion in the Roman empire in 313, which also included Christianity. The church originally served as a papal residence. It lost this function after the papal return from Avignon (1309-1377), in part due to a number of fires. 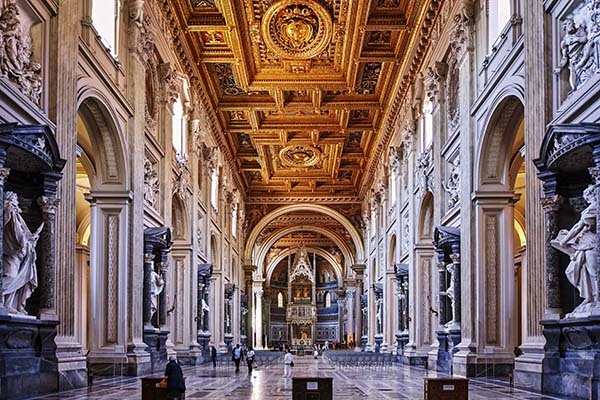 But the church remained one of the four Papal churches of Rome along with St. Peter’s Basilica (the other two Papal churches are Santa Maria Maggiore and San Paolo Fuori le Mura). It is worth noting that this church is the cathedral of the diocese of Rome, technically giving it the status of the most important church in Rome. The basilica is the oldest church building in Rome, but little was left of the original after a severe earthquake in 896. Not until 1650 was the church thoroughly rebuilt by architect Borromini for pope Innocent X, giving it its current baroque appearance. It was not until the 18th century that the church was given its beautiful façade with 15 statues by Alessandro Galilei. The only medieval remnant of the church is the octagonal baptistery from the 5th century. The name ‘Laterano’ is derived from the family name ‘Lateranus’. That is because the church was built in the gardens of the former palace of the royal family of Plautius Lateranus. He was sentenced to death under Emperor Nero for allowing Christians to hide in his palace, and his palace was confiscated by emperor Nero. Three centuries later, emperor Constantine gave the palace back to pope Miltiades, after which the palace was used as a papal residence. In the centre of the church is the gothically decorated papal altar with relics from Paul and Peter behind golden bars. The church also has twelve statues representing the apostles, made by students of Bernini. The frescos on the ceiling were a design by Michelangelo, but they were carried out by his apprentice, Giacomo della Porta. The green central doors of the church originally came from the senate building on the Forum Romanum. The church contains six papal tombs: Pope Sergius IV (1009-1012), Pope Alexander III (1159-1181), Pope Innocent III (1198-1216), Pope Martinus V (1417-1431), Pope Clement XII (1730-1740) and Pope Leo XII (1878 -1903). The obelisk on Piazza San Giovanni square in Laterno is one of the largest and oldest obelisks of Rome. Across from the basilica are the Scala Sanctan (‘Holy Steps’). These steps are said to have once been part of the headquarters of Pontius Pilate in Jerusalem. It is believed Jesus himself walked those steps, and they were later brought to Rome as a relic. These steps lead to the ‘Holy of Holies’, and the faithful climb the steps on their knees, earning them an indulgence since pope Pius VII. 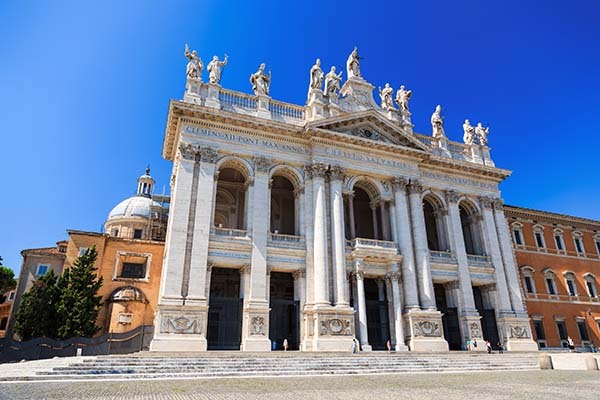 Where is the archbasilica in Rome?